The four million brown shirted Nazi storm troopers, the SA (Sturmabteilung), included many members who actually believed in the ‘socialism’ of National Socialism and also wanted to become a true revolutionary army in place of the regular German Army. But to the regular Army High Command and its conservative supporters, this potential storm trooper army represented a threat to centuries old German military traditions and the privileges of rank. Adolf Hitler had been promising the generals for years he would restore their former military glory and break the “shackles” of the Treaty of Versailles which limited the Army to 100,000 men and prevented modernization. The SA was headed by Ernst Röhm, a battle scarred, aggressive, highly ambitious street brawler who had been with Hitler from the very beginning. Röhm and the SA had been very instrumental in Hitler’s rise to power by violently seizing control of the streets and squashing Hitler’s political opponents. However, by early 1934, a year after Hitler came to power, the SA’s usefulness as a violent, threatening, revolutionary force had effectively come to an end. Hitler now needed the support of the regular Army generals and the big industry leaders to rebuild Germany after the Great Depression, re-arm the military and ultimately accomplish his long range goal of seizing more living space for the German people. At the end of February, 1934, Hitler held a meeting attended by SA and regular Army leaders including Röhm and German Defense Minister General Werner von Blomberg. At this meeting Hitler informed Röhm the SA would not be a military force in Germany but would be limited to certain political functions. In Hitler’s presence, Röhm gave in and even signed an agreement with Blomberg. Within the SA at this time was a highly disciplined organization known as the SS (Shutzstaffel) which had been formed in 1925 as Hitler’s personal body guard. SS chief Heinrich Himmler along with his second-in-command, Reinhard Heydrich, and Hermann Göring, began plotting against Röhm to prod Hitler into action against his old comrade, hoping to gain from Röhm’s downfall. On June 4, Hitler and Röhm had a five hour private meeting lasting until midnight. A few days later Röhm announced he was taking a ‘personal illness’ vacation and the whole SA would go on leave for the month of July. He also convened a conference of top SA leaders for June 30 at a resort town near Munich which Hitler promised to attend to sort things out. On June 17, Vice Chancellor Franz von Papen, who had helped Hitler become Chancellor, stunned everyone by making a speech criticizing the rowdy, anti-intellectual behavior of the SA and denouncing Nazi excesses such as strict press censorship. 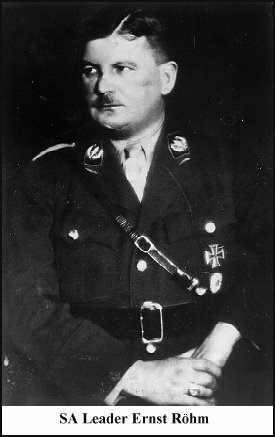 Papen also focused on the possibility of a ‘second revolution’ by Röhm and the SA and urged Hitler to put a stop to it. “Have we experienced an anti-Marxist revolution in order to put through a Marxist program?” Papen asked. His speech drastically increased the tension between German Army leaders and SA leaders and further jeopardized Hitler’s position. But for the moment Hitler hesitated to move against his old comrade Röhm. A few days later, June 21, Hitler went to see German President Paul von Hindenburg at his country estate. Hindenburg was in failing health and now confined to a wheelchair. Hitler met with the Old Gentleman and Defense Minister Blomberg and was stiffly informed the SA problem must be solved or the president would simply declare martial law and let the German Army run the country, effectively ending the Nazi regime. Meanwhile, Himmler and Heydrich spread false rumors that Röhm and the SA were planning a violent takeover of power (putsch). On June 25, the German Army was placed on alert, leaves canceled and the troops confined to the barracks. An agreement had been secretly worked out between Himmler and Army generals ensuring cooperation between the SS and the Army during the coming action against the SA. The Army would provide weapons and any necessary support, but would remain in the barracks and let the SS handle things. Charles Marsh has chosen an apt title for his worthwhile new biography of German pastor and theologian Dietrich Bonhoeffer, who died in a Nazi concentration camp in 1945. “Strange Glory” is a reference to a passage in one of Bonhoeffer’s sermons on the nature of God. But the phrase also captures the life of Bonhoeffer himself. In Marsh’s telling, Bonhoeffer was a bundle of contradictions. A pacifist who condemned all violence, he joined a conspiracy to assassinate Hitler. A neo-orthodox Lutheran who criticized liberal Protestants for their lack of Reformation rigor, he came to champion the very un-Lutheran idea of monasticism as a way to restore the church. By the end of his life, he was talking about the need for a “religionless” Christianity. He was a mystic who liked fine clothes. Marsh jokes that Bonhoeffer was perhaps the only monk ever to be described by his brothers as a sporty dresser. He could be pompous, arrogant, and childish–solitary and a bit of a misfit. And he was exceptionally brave. In 1939, he left Germany for a visiting appointment at Union Theological Seminary in New York. He surely could have remained safely in America for the duration of the war. Indeed, he could have enjoyed the life of a celebrity emigre. But his sense of duty made him return to share in the suffering of his people. My surgery began earlier than scheduled. I was on the operating table by 12:10 pm. The anesthetist had me sleeping soon after that. The operation lasted one hour and five minutes. When I woke up, I had no idea where I was. It was such a deep sleep. The surgeon told me in post-op that there was a major tear in the meniscus in my right knee. Now, it is rest, elevation and ice. And prayer and the Word! The Lord has slowed me down! Tomorrow at 12:30 pm, I will be having surgery on my knee. Last week, I tore cartilage in my right knee as I ran from third base to home in the over-50 softball league I play in (I will be 55-years-old in July). The MRI and X-rays revealed that there was damage in the cartilage in two different places in my right knee. There is always (I believe) a certain amount of nervousness before surgeries. I also know that my knee surgery is minor compared to the major surgeries that many people face every day. Yet, I know I must keep my mind on the Lord and things above. I also thought of Dietrich Bonhoeffer who spent his last night on earth knowing he was going to the gallows the next day. And, of course, the Lord Jesus prayed in the garden the night before he was crucified on the cross for our sins. Though some of the Bonhoeffer intelligentsia rushed to criticize Eric Metaxas’s Bonhoeffer: Pastor, Martyr, Prophet, Spy (Thomas Nelson, 2010), few can argue whether any book has more broadly brought Dietrich Bonhoeffer’s name to the fore. Though American readers have long read Discipleship, Life Together, and Letters and Papers from Prison, Metaxas’s biographical behemoth reintroduced Bonhoeffer with unprecedented reach. Many of Metaxas’s readers were surprised to discover details of Bonhoeffer’s life they never knew. Having been made available years before in the English translation of Eberhard Bethge’s unrivaled masterpiece (on which Metaxas based much of his own work), Bonhoeffer’s personal journey was veiled in relative obscurity, left to the Bonhoeffer scholars and historians until Metaxas popularized it for an American audience. We are truly in his debt. I often hear profound interest expressed in Bonhoeffer’s time in the United States, particularly his time studying at Union Theological Seminary in New York City (1931) after readers learn about Bonhoeffer’s life story for the first time. They are interested to know, for example, that Bonhoeffer was deeply affected by his experience worshiping and engaging in youth work at Abyssinian Baptist Church in Harlem. They are intrigued to learn that Bonhoeffer formed a lifelong friendship with an African American student named Frank Fisher, who led Bonhoeffer on a trip to Howard University (Washington, D.C.), where Fisher was denied food service at a local restaurant (Bonhoeffer refused to dine there). They are shocked to learn Bonhoeffer visited the Deep South and stared Jim Crow in the face with his own two eyes. It’s safe to say that these experiences, among others, informed Bonhoeffer’s convictions about racism for the rest of his life. But it would be a mistake to assume he did not grow in understanding. Bonhoeffer, like all of us, had blind spots. Take for example the following correspondence between Dietrich Bonhoeffer and his brother Karl Friedrich during his post-doctoral studies in America. It’s rather shocking, in hindsight, to consider how two men so personally invested in fighting racism in the German context could have been so blind to the truth just two years before Hitler was named chancellor. The so-called Jewish question was in fact no joke. But neither was racism in America. Bonhoeffer and his brother saw a serious problem in America with distinct clarity, though they underestimated the severity of racism in their own context. We need to be careful on this point, but it’s safe to say that the racial prejudice in both contexts was atrocious. And so often it is the same way with us. We easily identify blind spots in contexts other than our own while nurturing our own forms of blindness. Our own blind spots would not be so if we could see them (that’s why they are aptly named). You probably know the powerful history of Germany’s Dietrich Bonhoeffer. But you might not realize his strong connection to the American black community. Did you know that Bonhoeffer — one of the first German Nazi resistance leaders — formed his opinions after he visited the US and attended a black Baptist church in Harlem? It was at that Baptist church — where he also taught Sunday School — that he learned about the black spirituals that have formed so much of our American culture. But it was also there where he observed, with profound sadness, that the church was inept to bring about integration. When Bonhoeffer returned to Germany, the Nazi party was rising and he saw no other choice but to take to the radio and speak against their racist policies and engaged the church to denounce them. He vocally opposed Hitler’s euthanasia program and genocidal persecution of the Jews, telling German Christians to rise up and build a resistance. Torn by his faith and his avowed pacifism, he participated in an assassination plot on Adolf Hitler. But his resistance came with a price. He was hung in a concentration camp in 1945. Today, we celebrate Bonhoeffer as a martyr because he risked his own life to save others, and to save the soul of a nation. Imagine if more would have followed Bonhoeffer’s call to live their faith in a secular world — especially in the face of evil. Friend, the American black church helped to form one of the first and most powerful Nazi resistance leaders. The black church eventually created more resistance leaders through the years, notably Martin Luther King. But sadly, the heroes like King and Bonhoeffer are few and far between — and nearly invisible today. But I believe there are more heros who are undiscovered and need inspired. That’s why I want to tell Bonhoeffer’s story to my pastors by sending them a biography of his life by Michael Van Dyke. Will you sponsor one or more pastors to receive this book by clicking and following this link to donate $35, $50, $100, $250 or $500? In an interview I did with Ben Carson, he told me that we need more Americans to read inspirational stories of people who fight for what is right. That’s why I want to send Dietrich Bonhoeffer’s story, a student of the black church, to all of the pastors in my network. Imagine more Americans rising up to resist the soul-crushing leviathan of the welfare state. Imagine more blacks resisting today’s genocide of the black race with millions of babies killed before they are born. With your immediate support, this project allows my team to survey my network and identify what they believe, and what we need to do to encourage them to become resistance leaders, again! Your sponsorship of $35 will tell Bonhoeffer’s story to one pastor who will then become inspired to share his story with his congregation. This story is a story of the black church, but it is not well known. I know it can spread. You can make it happen. Let’s inspire more Americans to resist the growing powers of a corrupt government! Your sponsorship of $100 or more will send six of the pastor’s in my network a book about Bonhoeffer’s life, our survey, and communication with my team as we approach the important elections in November. This project will take $20,000 to accomplish. Let’s remind the black community about one of their own students who lived his faith and resisted the Nazi regime, Dietrich Bonhoeffer, by clicking and following this link to immediately donate $35, $50, $100, $250 or even $500 or more. Dietrich Bonhoeffer: Are We Faithful in the Little Things in Life?